These are essential resources for anyone restoring a Heinkel Car or Scooter. 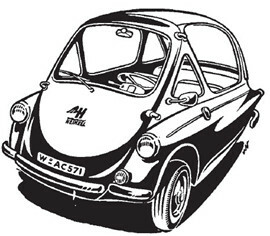 There are two clubs, the Heinkel Club of Germany and the Heinkel-Trojan Club in the UK. The German club has 4000 members, has a huge selection of parts, and has a paid staff to fill orders and produce the quarterly newsletter. The English club is smaller and is staffed by dedicated volunteers. They issue newsletters 6 times per year. Both have websites with historical information, photos, and membership info. You cannot order parts without being a member. Membership is approximately $30 per year (US). I belong to two Yahoo Groups: MicroCar-Minicar and Microcars. MicroCar-Minicar seems to have more posts, although I notice members posting on both lists. Neither has specific Heinkel-oriented content, but there are Heinkel owners among the collectors who frequent these boards. In both cases you must submit a request to be a member. There are a few Facebook groups. Join the Heinkel Tourist Scooter Enthusiasts. This group is fairly active, and frequented by very knowledgeable people from around the world who answer your questions 24 hours per day! There's also the Heinkel Trojan forum. This is a Danish group with some English posts. Get your translator ready. Finally I suggest Bubbles, Micros, and Scoots. Mostly in English but people from everywhere post here.